Advances in information and communication technologies, particularly the emergence of the Internet as a major source of global information have encouraged tertiary educators to develop rich, technology-based learning environments. Moreover, ready access to multimedia at the desktop provides the opportunity to develop engaging and interactive learning resources to enhance traditional learning environments. As a consequence, educators of distance education students are now able to move away from traditional, print-based study packages and develop multimodal course materials. This paper provides a qualitative meta-analysis of the issues associated with academics’ adoption and integration of technology for developing distance education courses, emerging from a range of contemporary studies and presents a framework for the investigation of factors influencing academics’ adoption of technology. Keywords: multimodal; ICT; technology; distance education courses; obstacles; motivators. Information and communication technology (ICT) provides academics with an opportunity to create rich learning environments for their students, enhanced by the wealth of information and resources on the Internet, as well as the inclusion of a range of multimedia-based learning elements (Sankey & St Hill 2005). As a consequence many major distance education universities in Australia are now replacing traditional, print-based courses with multimodal, technology enhanced courses delivered via either online environments and/or on interactive CD (McDonald & Mayes 2005). Multimodal courses involve the use of multimedia and ICT to develop dynamic course resources that appeal to different sensory modes and a variety of learning styles (Sankey & Birch 2005; Zywno 2003). For example, a multimodal course may include elements such as, simulations, interactive diagrams, images, video and audio materials, interactive quizzes and crosswords, PowerPoint lectures with audio (e.g. Breeze), and hyperlinked examples. With this new flexibility, major concepts within course material may now be presented in a variety of modes (multiple representations), for example, in both a visual and aural form. This strategy has been shown in previous studies to lead learners to perceive that it is easier to learn, improve attention rates, and thus lead to improved learning performance (Chen & Fu 2003; Sankey 2006). However, before embarking on a full-scale conversion of traditional, print-based courses to a multimodal, technology-based format, universities and individual academics need to be more informed of the key motivations, enablers and barriers underpinning the change required and to learn from the experiences of those who have been innovators and early adopters of these newer approaches. Numerous studies have investigated factors that influence academics’ adoption and integration of ICT across a range of educational contexts. For example, studies conducted in the late 1990’s, whilst online e-learning was still a reasonably fresh concept, addressed issues, such as academics’ willingness to participate in distance education (Betts 1998; Schifter 2000). More recently, researchers have specifically focussed on academics’ attitudes toward the development of online courses (Ebersole & Vorndam 2003; Weston 2005). However, few studies have focused on factors that influence academics’ adoption and integration of ICT for the purpose of designing and delivering multimodal course materials primarily used for distance education (Birch & Gardiner 2005; Gordon 2005; Sankey & St Hill 2005). In this paper, a qualitative meta-analysis approach to the literature relating to factors influencing academics’ adoption and integration of ICT and multimedia for developing and delivering distance education courses is presented has been used (Paterson, Thorpe, Canam, & Jillings, 2001). Based on this meta-analysis, a framework for investigating institutional and individual factors influencing academics’ design and delivery of multimodal courses for distance education has been developed and a research methodology is proposed that will facilitate significant research being conducted in this field. The high cost of technology and vast investments of time means that successful adoption of ICT by academics is important (Bates 2003). However, research has revealed that this initial adoption may not have resulted in sustained and meaningful use or integration over a period of time (Cuban, Kirkpatrick & Peck 2001; Weston 2005). Indeed, it can clearly be seen that providing access to technology is not enough; users must recognise the opportunity to be sufficiently motivated to use it. Only then can the provision of appropriate infrastructure, resources and support for adopters be effectively supplied (Moser 2007). Moreover, given the high workloads many academic staff now face, and the time and effort involved in embracing ICT to support learning and teaching, it is important to determine the forces which drive or restrain academics from adopting and integrating ICT into their courses, programs and resources (Ebersole & Vorndam 2003; Maguire 2005). It may be suggested that an academics’ adoption and integration of ICT is influenced by both institutional and individual factors (Miller, Martineau & Clark 2000). Institutional factors would include issues such as institutional enablers and barriers, while individual factors would include opportunistic, pragmatic, psychological and pedagogical motivations and inhibitors. Each of these factors will be discussed below, individually and in detail. The main institutional factors that enable academics’ adoption and integration of ICTappear to be organisational and administrative support, professional development and training, peer support, mentors, and technology champions. However, on a more practical level, an essential facilitator of an academics’ adoption and integration of ICT is the provision by the institution of sufficient administrative support, including the necessary infrastructure and resources (Covington, Petherbridge & Egan Warren 2005; Jones & Kelley 2003; Moser 2007). Effective integration would usually also require some form of specialised training in both the use of technology and how to best integrate this technology into the curriculum, as well as release time from other activities to undertake the necessary training (Eastman & Owens Swift 2001; Carroll-Barefield et al. 2005; Maguire 2005). Peer support, the presence of mentors, role models or opinion leaders and technology champions, who are prepared to collaborate and share their experiences, conduct workshops, and coach colleagues in the use of technology, also appear to lead to more rapid diffusion of ICT among academics (Bates 2000; Covington, Petherbridge & Egan Warren 2005; Moser 2007). An example of this is seen when ‘early adopters’ of a new technology, or learning and teaching methodology, experience some success in this implementation, and thus their enthusiasm may encourage others to consider adopting similar approaches. On the other hand, institutional barriers to academics’ adoption and integration of ICT include a lack of time, lack of incentives, technological and resource limitations, lack of technical and instructional support, lack of formal plans, policies and processes, and security issues. A major barrier identified in the literature, to the adoption and integration of ICT, would seem to be the lack of time and impact on faculty workloads (Bates, Manuel & Oppenheim 2007; Moser 2007; Schifter 2002). Moreover, the use of incentives is essential in motivating academics to participate in distance education (Lee 2001). Further, the high cost of innovation and the need to plan for large scale expenditure, coupled with limited resources has created further barriers to the adoption and integration of ICT, for both the institution and individual academics (Eastman & Owens Swift 2001; Ebersole & Vorndam 2003; McCorkle, Alexander & Reardon 2001). Various studies have also confirmed that where an institution does not provide appropriate specialised technical support, the adoption and integration of ICT by academic staff is severely hindered (Bonk 2001; Chizmar & Williams 2001; Jones & Moller 2002; Lee 2001). Moreover, a perceived or actual failure by an institution to establish and implement effective strategic plans to increase an academics’ use of technology may further inhibit adoption and integration of ICT (McLean 2005; Weston 2005). Finally, concern about security issues presents another major barrier (Eastman & Owens Swift 2001). In particular, academics have expressed concerns about intellectual property rights at both an individual and institutional level, as well as the sometimes onerous task of complying to copyright regulations (Covington, Petherbridge & Egan Warren 2005; O’Quinn & Corry 2002; Jones & Kelley 2003). In addition to the institutional enablers and barriers mentioned above, there are a number of individual factors that appear to influence academics’ adoption and integration of ICT into educational environments. These factors may be categorised as being: opportunistic, pragmatic, psychological or pedagogical. Some academics see that the opportunity to provide students with access to rich sources of information on the Internet by incorporating hyperlinked examples and activities into courseware, as a motivating feature in exploring the use of technology to enhance their teaching practice (O’Donoghue, Singh & Dorward 2001). In many cases, academics have also embraced the opportunity to integrate additional multimedia elements into their courses, and thereby provide a more engaging and interactive learning environment for their students (Ebersole & Vorndam 2003). However, of major concern, for some, in doing this is the opportunity cost of adopting and integrating ICT; that is, less time to devote to research and other activities that lead to more tangible rewards, such as academic promotion and tenure (Howell, Williams & Lindsay 2005; Maguire 2005). Pragmatic motivations for the adoption and integration of ICT include the desire of academics to respond to student needs for greater access, flexibility and convenience (Ebersole & Vorndam 2003; Maguire 2005). Indeed, meeting the unique needs of distance education students, many of whom are working full-time and/or raising families, is of concern to many academics. For example, Schifter (2002) found that a key motivating factor for academics’ participation in providing extra support to their distance education students was to provide greater flexibility for these students, in terms of place, mode and time of study. This is particularly true for institutions who have high percentage of their enrolled students studying by distance education. The University of Southern Queensland for example has in excess of 75 percent of its students studying by distance education. Therefore, for this particular institution this becomes a key motivator, as some Faculties view these distance students to be their ‘core business’. There are also some academics who are driven by altruistic motivations to do what makes life easier for their students (Wolcott & Betts 1999). In particular, providing the convenience of communicating effectively with students via electronic means, independent of time and place, is perceived by many to be a genuine advantage (Ebersole & Vorndam 2003; McCorkle, Alexander & Reardon 2001). On the other hand, some academics have expressed concerns about the time it takes to develop and maintain courses involving ICT, and the subsequent impact on their workload (Moser 2007; Jones & Kelley 2003; O’Quinn & Corry 2002; Schifter 2000). This is also seen in the concern, that some academics have, about student resistance to electronically-provided materials, due to loss of face-to-face interaction, the costs associated with printing materials from the web, a lack of access to the required hardware and software, or the lack of computing skills required to ensure a student has fully accessed all that is required (Jones & Kelley 2003; Sheard, Postema & Markham 2000). Hence, some academics have argued that students need to be trained to use the technology if technology-based courses are to be accepted and valued by their students (Carroll-Barefield et al. 2005). Psychological motivations and personal characteristics. Technology has for many years captured the imagination of many educators, with some academics feeling personally motivated to use technology. They enjoy the intellectual challenge of developing and trialling new and innovative ideas, and gain personal satisfaction and self-gratification from so doing (Capobianco & Lehman 2004; Lee 2001, Maguire 2005). In particular, the application of ICT appeals to some academics because of the excitement or novelty of doing something new, different or innovative (Moser 2007; Schifter 2000; Smith 2001; Weston 2005). This is particularly true for those who are seen to be innovators and early adopters of the newer educational uses of ICT. These academics are typically more adventurous, less risk averse, and are likely to try new and novel ideas (Rogers 1995). In particular, the needs to acquire “cutting-edge” status and dissatisfaction with the status quo are seen to be major driving forces for some academics (McCorkle, Alexander & Reardon 2001). The adoption and integration of ICT appears to also allow some academics to feel a sense of renewal and regeneration, providing them with an opportunity to re-energise their teaching (Jones & Kelley 2003). Whereas, other academics can be seen to have adopted ICT more out of a sense that it is ‘the right thing to do’, or in response to peer or organisational pressure (Ebersole & Vorndam 2003; Jones & Kelley 2003). Of particular note, however, is the extent to which an academic’s attitude toward technology, in terms of relative advantage over current methods, compatibility with current practices, perceived usefulness and perceived ease of use, seems to be the primary determinant of whether a technology will, or should, be adopted (Davis, Bagozzi & Warshaw 1989; McDonald et al. 2004; McPhail & Birch 2004). Conversely, resistance to change has been identified as major impediment to ICT adoption and integration (McCorkle, Alexander & Reardon 2001). Fear of change, a lack of willingness to take risks, fear of deviating from entrenched instructional practices and lack of assurance about the benefits of technology, may well deter some academics from adopting ICT (Hunt, Eagle & Kitchen 2004; Weston 2005). Moreover, an academic’s perception of their ability to work effectively with technology (self-efficacy) is a major reason for the non-adoption of ICT (Cassidy & Eachus 2002; Wang, Ertmer & Newby 2004). This personal hesitancy, lack of self-efficacy or confidence when dealing with technology, or the feeling of being overwhelmed or intimidated by technology, may be overcome with time through training and/or coaching. However, in other cases, the level of fear and anxiety associated with the use of technology (“techno-phobia”) can be very inhibiting (Cini & Vilic 1999; Weston 2005). In many cases, this is due to a fear of the negative impact this may have on student evaluations, if the technology does not work, or if it is not accepted by students. This presents a major deterrent for some academics (McCorkle, Alexander & Reardon 2001). In recent year’s, multimedia in conjunction with hypermedia, has been successfully applied to many courses in order to cater for a wide variety of learning styles or modalities (Birch & Gardiner 2005; Sankey & St Hill 2005; Young, Klemz & Murphy 2003). In this particular context, learning styles are defined as “characteristic cognitive, affective, and physiological behaviours that serve as relatively stable indicators of how learners perceive, interact with, and respond to the learning environment” (Ladd & Ruby 1999, p. 363). It has been demonstrated on many occasions that learners are more comfortable learning in an environment which reflects their predominant learning style (Felder & Soloman 2001; Hazari 2004; Sankey 2006). Fleming (2001) proposes that learners have a preferred learning modality, namely, visual, aural, read/write or kinaesthetic, while many learners are multimodal (use a combination of these modalities). Multimedia can be used to develop a more inclusive curriculum that appeals to visual, aural and kinaesthetic learners and overcome differences in student performance that may result from different learning styles (St Hill 2000). Indeed, Karakaya et al., (2001) found that the extensive use of multimedia neutralised differences in student performances based on their different learning styles. Moreover, presenting material in a variety of modes has been used to encourage students, who have a predominant learning style, to develop a more versatile approach to learning (Morrison, Sweeney, & Heffernan 2003). There is also a strong case to suggest that multimedia- enhanced materials, particularly those that contain audio components, offer ESL (English second language) students quite a high level of additional support. Of particular interest to these students is the ability to replay the content. In one study, this feature was “considered extremely helpful in relation to understanding the concepts and aided their understanding of the English language and so was used to compliment (reinforce) their reading” (Sankey 2006). The concept of a multimodal technology enhance course used in this study refers to a course that involves the use of multimedia and ICT to develop engaging and interactive course resources and uses multiple presentation modes to represent the content knowledge and appeal to different learning styles and modal preferences (Chen & Fu, 2003; Moreno & Mayer, 2007; Sankey & St Hill, 2005). Moreno and Mayer (2007) believe that multimodal learning environments use different modes to represent content knowledge, for example verbal and non-verbal, where the non-verbal mode is the pictorial mode including both static and dynamic graphics. These different presentation modes (verbal and non-verbal) are used to appeal to students’ different sensory modalities (visual and auditory). Further, Multimodal courses allow instructional events or elements to be presented in more than one sensory mode (multiple representations), and thus have been used by some educators to further facilitate student learning (Ainsworth & Van Labeke 2002; Clark & Paivio 1991; Mayer 2003; Shah & Freedman 2003). Mayer (2003) contends that students learn more deeply from a combination of words and pictures than from words alone; known as the multimedia effect. Shah and Freedman (2003) also discuss a number of benefits of using visualisations in e-learning, including promoting learning by providing an external representation of the information, deeper processing of information, maintaining learner attention by making the information more attractive and motivating, and making complex information easier to comprehend. The development of technology enhanced courses may also result in a more current and relevant curriculum, innovation and new ideas, enhanced course quality, and diversification of academic programs (Maguire 2005; Smith 2001). Indeed, in some cases, ICT has significantly changed the way that teaching, learning and assessment occur (Franklin et al. 2001; Weston 2005). For example, the adoption and integration of ICT may lead to more student-centred approaches to teaching and learning, and thus support a more constructivist approach to course design (Hirumi 2002; Laurillard 2002). This is primarily due to the non-linear design of learning environments that has been found to increase learners’ control over the way they progress through their materials (Karagiorgi & Symeou 2005). Consequently, when materials are delivered electronically via an interactive CD and/or online, students’ can be encouraged to be more self-directed and to explore the resources and interact with the various elements housed in these environments in their own time and at their own pace. Depending upon their predominant learning style, students may self-select those learning objects or representations that best suit their modal preference (Sankey & St Hill 2005). This strategy can then be further supported by the use of on online discussion boards, where students are encouraged to develop learning communities, by collaborating and engaging in active dialogue and socially constructing knowledge through sharing and reflecting upon their experiences and perspectives and providing feedback to one another online (Jonassen 1999; Markel 1999; Wilson & Stacey 2004). Consequently, distance education courses may now provide a far richer learning environment by focusing on connection, interaction, exploration and discovery, rather than the one-way transmission of information (Peters 2000). Further, the educational use of technology, such as video and audio recorded lectures and presentations, allows greater personalisation of the learning resources for distance students, and thus may encourage higher quality interactions between instructors and their students (Waddoups & Howell 2002). Despite the apparent pedagogical benefits associated with the adoption and integration of ICT, Jacobsen (2002) noted that “both philosophical and pedagogical barriers to innovation exist when teachers shift from information-transmission to designing technology-enabled, constructivist learning environments” (p. 4). In particular, the need to adapt one’s teaching style and to redesign course content has presented a major barrier for some educators (Jones & Kelley 2003). Further, a lack of clarity about the benefits of technology, lack of willingness to take risks, and the need for more rigorous course planning have deterred some academics ‘entrenched in traditional tools and pedagogies’ from changing familiar instructional practices (Covington, Petherbridge & Egan Warren 2005, p. 9). Indeed, the successful integration of ICT requires an adjustment of pedagogy to allow for active participation, authentic tasks, collaborative learning, and individualised feedback (Knowlton 2002). Hence, educators need to consider altering their teaching styles and to develop new skills to help them integrate technology into their programs. In doing this, academics also need to gain some understanding of the relationship that exists between learning, interactivity and technology (Bates, Manuel & Oppenheim 2007). Thus, in adopting and integrating ICT, academics require some basic training in different aspects of contemporary instructional design (Eastman & Owens Swift 2001; Hazari 2004). As mentioned earlier, some academics have expressed pedagogical concerns, in terms of what impact ICT will have on student learning, while others have expressed a lack of confidence in the benefits for students (Ebersole & Vorndam 2003; McAlpine & Gandell 2003). Thus, Munoz (1993) stresses the importance of being ethical in the use of ICT and warns that educators should “resist the seductive force of technology to replace rather than enhance” (p. 49). Hence, academics’ adoption and integration of ICT for providing distance education courses is influenced by both institutional and individual factors. 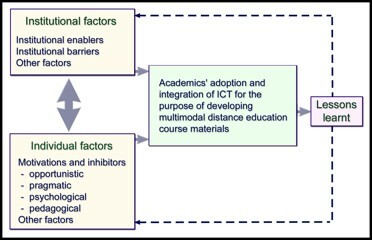 As the development of multimodal, technology-based courses for distance education continues to expand, research is required to determine the extent to which these factors also influence academics’ adoption and integration of ICT for this purpose, and whether other factors that have not been previously addressed in the literature might also be relevant and/or specific to this context. In light of the review of literature and discussion presented above, this paper suggests that more research is required into the factors that influence academics’ willingness to adopt and integrate ICT for the purpose of designing and delivering multimodal distance education courses. A provisional framework has been developed, and in now presented, that may be used as the basis for such an investigation (Figure 1). The framework indicates that both institutional and individual factors impact on academics’ adoption and integration of ICT. Institutional factors include institutional enablers and barriers, while Individual factors include opportunistic, pragmatic, psychological and pedagogical motivations and barriers. The provisional status of the framework allows for the investigation of other factors that influence the adoption and integration of ICT that have not been previously identified in other contexts. Moreover, the framework indicates that lessons learnt from past experiences with the adoption and integration of ICT may impact on future activities. To further explore factors that are relevant to the development of multimodal distance education courses in higher education, it is proposed that a qualitative exploratory case study of a major distance education university be conducted. The case study would involve analysing multiple sources of evidence including university documents concerning the development of multimodal, technology-based courses, physical artefacts including examples of multimodal, technology-based courseware, and in-depth interviews with academic staff across various adopter categories, as well as the instructional designers that assist academics with the development of distance education course resources. Figure 1: A provisional framework for investigating the institutional and individual factors influencing academics’ development of multimodal distance higher education courses. Such a study would contribute significantly to the body of knowledge on academics’ adoption and integration of ICT into educational environments, specifically in the context of the development of multimodal, technology-based distance education courses. Indeed, before embarking on a full-scale conversion of more traditional print-based materials to multimodal course resources used for distance education, institutions and individual academics need to be more informed of the key institutional and individual factors that influence the change process and learn from the experiences of the innovators and early adopters. Moreover, an understanding of the enabling and restraining factors involved will inform distance education providers regarding the infrastructure and resources required to support academics in the process of converting their print-based courses to technology-based courses and, where possible, reduce the barriers to adoption and integration of ICT. Despite the many studies that have clearly demonstrated the effectiveness of using ICT and integrating this with multimedia based solutions into a range of course materials, factors that influence academics’ adoption and integration of ICT across new distance education contexts, need further investigation. Institutional factors include both enablers and barriers, while individual factors include opportunistic, pragmatic, psychological and pedagogical motivations and inhibitors. Based on the findings of this meta-analsis of contemporary studies investigating these issues, a provisional framework for investigating institutional and individual factors that influence academics’ adoption and integration of ICT, for the purpose of designing and delivering multimodal distance education courses has been developed. A research methodology for investigating the research problem has also been proposed. Access to new technologies, the changing nature of higher education and an increasingly diverse student population highlight the need to review the ways higher education is delivered, particularly for those studying at a distance. It is therefore incumbent upon those wishing to now progress this debate to consider the issues and the factors raised in this paper to arrive at a more democratic model for providing distance education; one that more effectively caters to the needs of contemporary students and the various ways in which they learn. The authors of this paper would suggest that a multimodal approach to the development of distance education courses may be one model worth adopting. Ainsworth, S. & Van Labeke, N. 2002. “Using a multiple-representational design framework to develop and evaluate a dynamic simulation environment”. Proceedings of theInternational Workshop on Dynamic Visualisations and Learning, July, 1-9, Tubingen, Germany. Bates, M., Manuel, S., & Oppenheim, C. 2007. “Models of Early Adoption of ICT Innovations in Higher Education”, Ariadne, no. 50, Available online at: http://www.ariadne.ac.uk/issue50/oppenheim-et-al/ accessed 10 June 2007. Bates, T. 2000. Managing technological change: Strategies for college and university leaders, Jossey-Bass, San Francisco. Bates, T. 2003. Effective teaching with technology in higher education, Jossey-Bass, San Francisco. Betts, K.S. 1998. “An institutional overview: Factors influencing faculty participation in distance education in the United States: An institutional study”, Online Journal of Distance Learning Administration, vol. 1, no. 3. Available online at: http://www.westga.edu/~distance/betts13.html, accessed 30 May 2007. Birch, D. & Gardiner, M. 2005. “Students' perceptions of technology-based marketing courses”, Proceedings of Australia and New Zealand Marketing Educators Conference, December, 5-7, Fremantle, Australia. Bonk, C. J. 2001. Online teaching in an online world, Bloomington, CourseShare.com. Available online at: http://publicationshare.com/docs/faculty_survey_report.pdf, accessed 10 May 2007. Capobianco, B. & Lehman, J. 2004. “Using Technology to Promote Inquiry in Elementary Science Teacher Education: A Case Study of One Teacher Educator's Initiatives”. In C. Crawford et al. (Eds. ), Proceedings of Society for Information Technology and Teacher Education International Conference 2004, pp. 4625-4630. Chesapeake, VA: AACE. Carroll-Barefield, A., Smith, S.P., Prince, L.H., & Campbell, C.A. 2005. “Transitioning from brick and mortar to online: A faculty perspective”, Online Journal of Distance Learning Administration, vol. 8, no. 1. Available online at: http://www.westga.edu/%7Edistance/ojdla/spring81/carroll81.htm, accessed 6 May 2007. Cassidy, S. & Eachus, P. 2002. “Developing the computer user self-efficacy (CUSE) scale: Investigating the relationship between computer self-efficacy, gender and experience with computers”, Journal of Educational Computing Research, vol. 26, no. 2, pp. 169-189. Chen, G. & Fu, X. 2003. “Effects of multimodal information on learning performance and judgement of learning”, Journal of Educational Computing Research, vol. 29, no. 3, pp. 349-62. Chizmar, J.F. & Williams, D.B. 2001. “What do faculty want?” Educause Quarterly, no. 1, pp. 18-24. Cini, M.A. & Vilic, B. 1999. “Online teaching: moving from risk to challenge”. Syllabus, vol. 12, no. 10, pp. 38-40. Clark, J.M. & Paivio, A. 1991. “Dual coding theory and education”, Educational Psychology Review, vol. 3, no. 3, pp. 149-70. Covington, D., Petherbridge, D., & Egan Warren, S. 2005. “Best practices: A triangulated support approach in transitioning academic to online teaching”, Online Journal of Distance Learning Administration, vol. 8, no. 1. Available online at: http://www.westga.edu/%7Edistance/ojdla/spring81/covington81.htm, accessed 16 April 2007. Cuban, L., Kirkpatrick, H., & Peck, C. 2001. “High access and low use of technologies in high school classrooms: Explaining an apparent paradox”, American Educational Research Journal, vol. 38, no. 4, pp. 813-34. Davis, F.D., Bagozzi, R.P., & Warshaw, P.R. 1989.. “User acceptance of computer technology: A comparison of two theoretical models”, Management Science, no. 35, pp. 982-1003. Earle, R.S. 2002. “The integration of instructional technology into public education: promises and challenges”, Educational Technology Magazine, vol. 42, no. 1, pp. 5-13. Eastman, J.K. & Owens Swift, C. 2001. “New Horizons in distance education: The online learner-centred marketing class”, Journal of Marketing Education, vol. 23, no. 1, pp. 25-34. Ebersole, S. & Vorndam, M.2003. “Adoption of computer-based instructional methodologies: A case study”, International Journal on E-Learning, vol. 2, no. 2, pp. 15-20. Fleming, N. 2001. VARK:A guide to learning styles. Available online at: http://www.vark-learn.com/english/page.asp?p=questionnaire, accessed 12 May 2007. Franklin, T., Turner, S., Kariuki, M., & Duran, M. 2001. “Mentoring overcomes barriers to technology integration”, Journal of Computing in Teacher Education, vol. 18, no. 1, pp. 26-30. Gordon, R. 2005. “A case study of a new leadership course using distance-user input in design of hybrid delivery”, Proceedings of OLT-2005 Beyond Delivery Conference, pp. 106-11, Queensland University of Technology, Brisbane, Australia. Hazari, S. 2004. “Applying instructional design theories to improve efficacy of technology-assisted presentations”, Journal of Instruction Delivery Systems, vol. 18, no. 2, pp. 24-33. Hirumi, A. 2002. “Student-centred, technology-rich learning environments: Operationalizing constructivist approaches to teaching and learning”, Journal of Technology and Teacher Education, vol. 10, no. 4, pp. 497-537. Howell, S.L., Williams, P.B., & Lindsay, N.K. 2005. “Thirty-two trends affecting distance education: An informed foundation for strategic planning”, Online Journal of Distance Learning Administration, vol. 6, no. 3. Available online at: http://www.westga.edu/%7Edistance/ojdla/fall63/howell63.html, accessed 9 May 2007. Hunt, L., Eagle, L., & Kitchen, P.J. 2004. “Balancing marketing education and information technology: Matching needs or needing a better match”, Journal of Marketing Education, vol. 26, no. 1, pp. 75-88. Jacobsen, D.M. 2002. “Building different bridges two: A case study of transformative professional development for student learning with technology”, Paper presented at AERA 2002: Validity and Value in Educational Research, the 83rd Annual Meeting of the American Educational Research Association, April 1 – 5, New Orleans, LA. Jones, A. & Moller, L. 2002. “A comparison of continuing education and resident faculty attitudes towards distance education in a higher education institution in Pennsylvania”, College and University Media Review, vol. 9, no. 1, pp. 11-37. Jones, K.O. & Kelley, C.A. 2003. “Teaching marketing via the Internet: Lessons learned and challenges to be met”, Marketing Education Review, vol. 12, no. 3, pp. 81-9. Jonassen, D.H. 1999. Operationalizing mental models: Strategies for assessing mental models to support meaningful learning and design-supportive learning environments. Available online at: http://www.ittheory.com/jonassen2.htm, accessed 19 March 2005. Karagiorgi, Y. & Symeou, L. 2005. “Translating constructivism into instructional design: Potential and limitations”. Educational Technology & Society,vol. 8, no. 1, pp. 17-27. Karakaya, F., Ainscough, T.L., & Chopoorian, J. 2001. “The effects of class size and learning style on student performance in a multimedia-based marketing course”, Journal of Marketing Education, vol. 23, no. 2, pp. 84-90. Knowlton, D.S. 2002. “Technology-enhanced courses versus traditional instruction: Empirical evidence, reflections from practice, and designing for maximum learning”, The CyberPeer Newsletter, Crichton Distance Education, Memphis. Ladd, P. & Ruby, R. 1999. “Learning style and adjustment issues of international students”, Journal of Education for Business, vol. 74, no. 6, pp. 363-68. Laurillard, D.M. 2002. “Rethinking university teaching: A framework for the effective use of educational technologies.” (2nd ed. ), Routledge Falmer, London. Lee, J. 2001, “Instructional support for distance education and faculty motivation, commitment, satisfaction”, British Journal of Educational Technology, vol. 32, no. 2, pp. 153-60. Leu, D.J., Kinzer, C.K., Coiro, J.L., & Cammack, D.W. 2004. “Toward a theory of new literacies emerging from the internet and other information and communication technologies”. In R. B. Ruddell & N. Unrau (eds. ), Theoretical models and processes of reading, no. 5, pp. 1570-1613. Newark, DE: International Reading Association. Maguire, L.L. 2005. “Literature review: Faculty participation in online distance education: Barriers and motivators”, Online Journal of Distance Learning Administration, vol. 8, no. 1. Available online at: http://www.westga.edu/~distance/ojdla/spring81/maguire81.htm, accessed 4 April 2007. Markel, M. 1999. “Distance education and the myth of the new pedagogy”, Journal of Business and Technical Communication, vol. 13, no. 2, pp. 208-22. Mayer, R.E. 2003. “Elements of a science of e-learning”, Journal of Educational Computing Research, vol. 29, no. 3. pp. 297-313. McAlpine, L. & Gandell, T. 2003. “Teaching improvement grants: What they tell us about professors' instructional choices for the use of technology in higher education”, British Journal of Educational Technology, vol. 34, no. 3, pp. 281-93. McCorkle, D.E., Alexander, J.F, & Reardon, J. 2001. “Integrating business technology and marketing education: Enhancing the diffusion process through technology champions”, Journal of Marketing Education, vol. 23, no. 1, pp. 16-24. McDonald, J. & Mayes, T. 2005. “Pedagogically challenged: A framework for the support of course designers in an Australian distance learning university”. Proceedings of Centre for Research in Lifelong Learning International Conference, June 24-26, pp. .379-404, Scotland. McDonald, J, McPhail, J., Maguire, M., & Millett, B. 2004. “A conceptual model and evaluation process for educational technology learning resources: A legal case study”, Educational Media International, vol. 41, no. 4, pp. 281-90. McLean, J. 2005. “Addressing faculty concerns about distance learning”. Online Journal of Distance Learning Administration, vol. 8, no. 4. Available online at: http://www.westga.edu/~distance/ojdla/winter84/mclean84.htm, accessed 1 February 2007. McPhail, J. & Birch, D. 2004. “Students’ attitudes towards technology-enhanced learning resources for an introductory marketing course”, Proceedings of Australia and New Zealand Marketing Educators Conference, November 29 – December 1, Wellington, New Zealand. Miller, J., Martineau, L., & Clark, R. 2000. “Technology infusion and higher education: Changing teaching and learning”, Innovative Higher Education, no. 25, pp. 227-41. Moreno, R. & Mayer, R. 2007. “Interactive multimodal learning environments”. Educational Psychology Review, no. 19, pp309-326. Morrison, M., Sweeney, A., & Hefferman, T. 2003. “Learning styles of on-campus and off-campus marketing students: The challenge for marketing educators”, Journal of Marketing Education, vol 25, no. 3, pp. 208-217. Moser, F.Z. 2007. “Faculty adoption of educational technology” EDUCAUSE quarterly, no 1. pp. 66-9. Available online at: http://www.educause.edu/ir/library/pdf/eqm07111.pdf accessed 10 June 2007. Munoz, Z.C. 1993. “A technophile looks at technology, education and art”, Art Education, vol. 46, no. 6, pp. 48-9. O'Donoghue, J., Singh, G., & Dorward, L. 2001. “Virtual education in universities: A technological imperative”, British Journal of Educational Technology, vol. 32, no. 5, pp. 511-23. O'Quinn, L. & Corry, M. 2002. “Factors that deter faculty from participating in distance education”, Online Journal of Distance Learning Administration, 5, 4. Available online at: http://www.westga.edu/~distance/ojdla/winter54/Quinn54.htm, accessed 24 March 2007. Paterson, B.L., Thorpe, S.E., Canam, M., & Jillings, C, (2001). “Meta-study of qualitative health research: A practical guide to meta-analysis and meta-synthesis.” Thousand Oaks, CA: Sage Publications. Peters, O. 2000. “Digital learning environments: New possibilities and opportunities”, International Review of Research in Open and Distance Learning, vol. 1, no. 1. Available online at http://www.irrodl.org/index.php/irrodl/article/view/3/23 , accessed 7 June 2007. Rogers, E.M. 1995. Diffusion of Innovations (4th ed. ), Free Press, New York. Sankey, M.D. 2006. “A neomillennial learning approach: Helping non-traditional learners studying at a distance”. The International Journal of Education and Development using Information and Communication Technology (IJEDICT), vol. 2, no. 4, pp. 82-99. Available onoline at: http://ijedict.dec.uwi.edu/viewarticle.php?id=224&layout=html , accessed 10 June 2007. Sankey, M. & Birch, D. 2005. “Researching transmodal delivery at USQ: Different horses for different courses”, Paper presented at the New Researchers for New Times Conference, October 28, Queensland University of Technology, Brisbane. Australia. Sankey, M. & St Hill, R. 2005. “Multimodal design for hybrid learning materials in a second level economics course”, Proceedings of 11th Australasian Teaching Economics Conference: Innovation for Student Engagement in Economics, July 11-12, pp. 98-106, University of Sydney, Australia. Schifter, C.C. 2000. “Faculty motivators and inhibitors for participation in distance education”, Education Technology, vol. 40, no. 2, pp. 43-6. Schifter, C.C. 2002. “Perception differences about participating in distance education”, Online Journal of Distance Learning Administration, vol. 5, no. 1. Available online at: http://www.westga.edu/~distance/ojdla/spring51/schifter51.html, accessed 12 January 2007. Shah, P. & Freedman, E.G. 2003. “Visuospatial cognition in electronic learning”. Journal of Educational Computing Research, vol. 29, no. 3, pp. 315-24. Sheard, J., Postema, M., & Markham, S. 2000. “Paper-based and web-based resources: What do students value?” Proceedings ofSixth Australian World Wide Web Conference (AusWeb 2K), Cairns. Available online at http://ausweb.scu.edu.au/aw2k/papers/sheard/index.html , accessed 12 January 2007. Smith, L.J. 2001 “Content and delivery: A comparison and contrast of electronic and traditional MBA marketing planning courses”, Journal of Marketing Education, vol. 23, no. 1, pp. 35-44. St Hill, R. 2000. “Modal preference in a teaching strategy”, Paper presented atEffective teaching and learning at university, November 9-10, University of Queensland, Brisbane, Australia. Waddoups, G.L. & Howell, S.L. 2002. “Bringing online learning to campus: The hybridization of teaching and learning at Brigham Young University”, International Review of Research in Open and Distance Learning, vol. 2, no. 2, pp. 1-13. Wang, L., Ertmer, P.A., & Newby, T. 2004 “Increasing pre-service teachers' self-efficacy beliefs for technology integration”, Journal of Research on Technology in Education, vol. 36, no. 3, pp. 231-50. Weston, T.J. 2005. “Why faculty did - or did not - integrate instructional software in their undergraduate classrooms”, Innovative Higher Education, vol. 30, no. 2, pp. 99-115. Wilson, G. & Stacey, E. 2004. “Online interaction impacts on learning; Teaching the teachers to teach online”, Australasian Journal of Educational Technology, vol. 20, no. 1, pp. 33-48. Wolcott, L.L. & Betts, K.S. 1999. “What’s in it for me? Incentives for faculty participation in distance education”, Journal of Distance Education, vol. 14, no. 2, pp. 34-49. Young, M.R., Klemz, B.R., & Murphy, W.M. 2003. “Enhancing learning outcomes: The effects of instructional technology, learning styles, instructional methods, and student behaviour”, Journal of Marketing Education, vol. 25, no. 2, pp. 130-42. Zhao, Y. & Frank, K.A. 2003. “Factors affecting technology uses in schools: An ecological perspective”, American Educational Research Journal, vol. 40, pp. 807-41. Zwyno, M.S. 2003, “Hypermedia instruction and learning outcomes at different levels of Bloom’s taxonomy of cognitive domain”, Global Journal of Engineering Education, vol. 7, no. 1, pp. 59-70. Zywno, M.S & Waalen, J.K. 2002. “The effect of individual learning styles on student outcomes in technology-enabled education”, Global Journal of Engineering Education, vol. 6, no. 1, pp. 35-44.